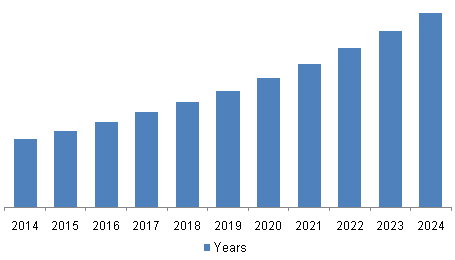 Image Sensors Market Revenue Is To Reach A Value Of $26.41 Billion Forecast Till 2024: Grand View Research, Inc.
San Francisco, 8 November 2018 – The global image sensor market is anticipated to reach USD 26.41 billion by 2024, according to a new report by Grand View Research, Inc. The industry is poised for an unprecedented growth over the forecast period owing to the rising expenditure on security & surveillance in public places across regions and increasing disposable income across the emerging and developing economies. The impact of information technology in the automotive, defense, medical, and industrial application has driven the demand for image sensors over the projected period. Increasing adoption of technologies for improving anti-terror equipments mitigating the security lapses has demanded for better camera resolution, which has further enhanced the market growth. The IP cameras are expected to have a significant growth over the forecast period as compared to analog cameras, which is due to higher resolution, secure transmission, ability to cover more distance, high-speed recording, and lower cable cost. Consumer electronics is expected to be the key application segment having the significant penetration and is also anticipated to grow at a considerable rate over the forecast period. The leading companies in the market are seeking new revenue sources as the smartphone market is attaining maturity. This has resulted in increased demand for the image sensors in the wearable industry and other applications. The increasing R&D expenditure on the deployment to have a raw material access is expected to compel the backward integration at the buyer’s end. For instance, Beijing-based Hua Capital Management Co., Ltd. planned to acquire U.S-based OmniVision Technologies, Inc. in 2016 to overcome the supply shortage in the market. The image sensor market is anticipated to witness a considerable growth over the projected period owing to the increasing awareness of early diagnosis. Moreover, a growing number of diagnostics imaging procedures have increased the demand for imaging systems in the healthcare facilities. The CMOS technology is anticipated to grow at significant CAGR over the projected period owing to the characteristics such as low power consumption, high immunity to noise, and less emission of waste heat. Consumer electronics is anticipated to gain the highest revenue over the forecast period owing to the wide applications in devices such as wearable, tablets, notebooks, PCs, webcams, gaming consoles, and so on. The industrial/defense application is anticipated to witness a CAGR of over 15.2% over the forecast period. The growth is attributed to the increased defense spending by countries across the region. The increasing performance of the high-end CMOS technology is competing with the CCD technology on the factory floors. Reducing the cost of mainstream cameras and sensors allows vision to be used effectively in the industrial applications. The North American image sensor industry is anticipated to have a significant growth over the forecast period. The increasing per capita healthcare expenditure and prevailing large consumer base have influenced the growth in the region. The key players in the image sensor market include OmniVision Technologies, Inc., (U.S.), Toshiba Corporation (Japan), and Pixart Imaging, Inc. (China). Companies are focusing on developing new products to enhance their market share.